Can I use the Photon LP with my computer? Is this turntable powered by the USB cable or wall adapter? Can I play a 78 RPM record with this turntable? How do I connect this to my home stereo? I need to order a new stylus. Where can I get a new stylus? Is there a dust cover available for this turntable? My record is skipping what should I do? My turntable isn't spinning when I move the tonearm over the record. What do I do? Why does my turntable move when I push on it? Where can I get further technical support?Where can I get further technical support? Yes. One cable is all you need to connect Photon LP to your computer, and it’s included with purchase. Just connect it to your Mac or PC using the included USB cable. The Photon LP also comes with the EZ Vinyl Tape Converter to easily record and save your records directly to your computer! The ION Audio Photon LP ships with a power adapter for connecting the unit to a wall plug for power. 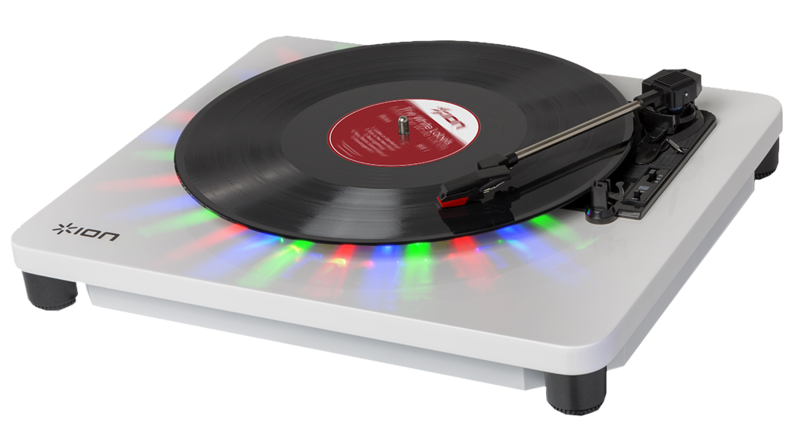 The Photon LP has 3 speeds: 33 1/3, 45, and 78 RPM. However, in order to play any 78 RPM record, an alternative 78 RPM stylus would need to be used. ION Audio makes a 78 RPM stylus which can be used. It can be purchased directly from this link. If you have connected speakers to the Photon LP using the RCA Audio output connections, do NOT connect the RCA cables to a Phono input as this could damage your speakers. Ensure that you connect them to a line-level input such as AUX, CD, or TAPE. The included stylus will likely last many years without the need to replace it. However, if you would like to purchase a replacement cartridge and stylus, you can get one directly from the ION Audio website at this link. Does this turntable come with a dust cover? Yes! The ION Audio Photon LP ships with a dust cover. If you need a replacement dust cover, contact ION Audio Support for assistance. If the record is skipping try cleaning the record directly using standard lp cleaning techniques. For some materials that can help with the cleaning of your vinyl, you can find the VINYL ALIVE Record Cleaning Kit on the ION Audio website. If the record continues to skip, consider replacing the stylus which can be purchased directly from ION Audio here. Move the tonearm back and forth from the resting point to the center of the turntable and back, 5-10 times. Try again. It should begin to spin with the tonearm over the record after moving the it 5-10 times. If you continue to experience difficulties, contact ION Audio Technical Support. Yes! The Photon LP comes with a replaceable 8-inch belt. If you need to purchase one, contact the ION Audio parts team at parts@inmusicbrands.com. Additionally, this guide walks through how to replace the belt. This is normal! The turntable mechanism base, platter & tonearm are engineered to float above the platform on isolation mountings to allow some give when slightly jostled without skipping.